Ajaz Akhtar took 6-30 as Barnack hammered Grantham. There was double delight for Barnack on Sunday (August 19) as they moved closer to a first Rutland Division One title since 1994 and reached a cup final. Barnack’s fixture at Grantham doubled as a league game and a semi-final of the John Wilcox Trophy and it turned into something of a rout. Chris Milner on his way to 101 for Peterborough Town at Ketton Sports. Veteran all-rounder Ajaz Akhtar bagged 6-30 and Belgian international Faisal Khaliq took 4-36 as the home side were despatched for just 67 in 23 overs, a total Barnack passed for the loss of two wickets. A first title win in 24 years would be some result for Barnack who faced an effective relegation play-off against Market Deeping on the final day of last season. They won that game and since then have won 15 of their last 17 competitive Sunday games. Only Ketton Sports have beaten them (twice) this summer and they blew their title chances by losing at home to Peterborough Town by 79 runs. 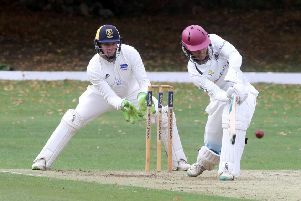 Wicket-keeping opening batsman Chris Milner was Town’s star cracking 101 of his side’s 211-8. Elder brother Matt Milner was next highest scorer with 35 not out. Sam Evison smacked 138 for Bourne against Wisbech. Youngsters Mohammed Danyaal (4-28) and Connor Parnell (3-32) ensured Ketton never came close to victory despite 59 from Peter Rowe. Bashrat Hussain (5-24 & 28) had a decent all-round day for the losers. Sam Evison thrashed 138 and Ben Woodward took 5-53 as Bourne crushed Wisbech by 157 runs, while Oundle won a pitifully low scoring game at bottom club Weldon. Oundle passed Weldon’s 68 all out with one wicket in hand. Barnack host holders Wisbech in the John Wilcox Trophy Final on Bank Holiday Monday (August 27, noon). Wisbech also have a Cambs Division One match on that day. Grantham 67 (A. Akhtar 6-30, F. Khaliq 4-36). Bourne 260-9 (S. Evison 138, B. Woodward 38no, B. Keast 28, K. Haynes 4-42, G. Freear 2-72). Wisbech 103 (D. Haynes 26, B. Woodward 5-53, D. Bandaranaike 3-36). Town 211-8 (C. Milner 101, M. Milner 35no, B. Hussain 5-24). Ketton 132 (P. Rowe 59, B. Hussain 28, M. Danyaal 4-28, C. Parnell 3-32, M. Milner 2-20). Weldon 68 (C. Craig 4-9, H. Craig 3-25). Oundle 69-9 (J. Dalley 26).